I scrolled across this hashtag on Instagram this week, and it spoke to me. 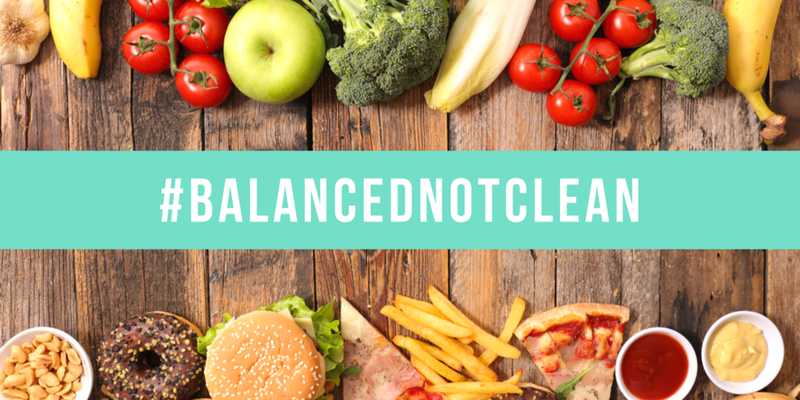 #balancednotclean What does it mean, Balanced, not clean? Eating clean has become the popular way to eat healthily, but what does it mean to eat clean? 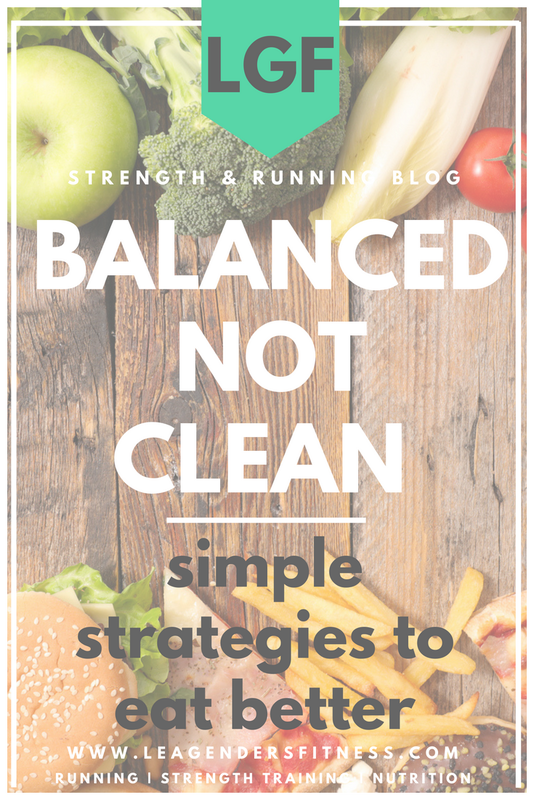 There is no one definition of eating clean. Some will tell you that it means to eat unprocessed foods from nature. Great, we could all use a little more of that. Some will say it means to remove dairy and grains from your diet, while others claim it means to eliminate animal products. What does it mean to you? It's ok to have your unique definition, we are all individuals and may respond to food in different ways. You should strive to eat in a way that makes you look, feel, and perform your best, whatever that means for you. You don't have to label it. I prefer to not view food as clean or dirty, and good or bad. Yes, some foods are better for your health than others, of course, but there are also some foods that are better for celebrating birthdays. Have you ever put birthday candles on a bowl of kale? No, because that would be weird. The key to living a healthy, yet sustainable lifestyle is finding the balance between what is healthy for your body, and what you enjoy. Celebrations, connections with family and friends, and special occasions are also part of an overall healthy lifestyle. If you stress for days about eating a piece of pizza at your son's birthday party, that added stress isn't healthy either. balanced not clean. Save to your favorite Pinterest board for later. I try not to have such a narrow focus on food, but to expand my thinking to include an overall healthy lifestyle, not just a healthy meal. Turning down dinners with friends or eating alone because you don't want to explain your food choices to people could be an unhealthy behavior, even if the food you are eating is healthy for your body. Try to make the best choices possible with what is available at the moment. That means if you're out to dinner with friends and grass-fed meat and organic vegetables aren't on the menu at Chick-fil-a, try to make the next reasonably best choice, even if the next best option is a fast food salad or a plain chicken sandwich. We don't have to eat perfectly, just do the best we can. Picture the most delicious, but unhealthy meal you can conjure up. Go ahead. Can you smell it? Almost taste it? Is it from your favorite restaurant? Or something Grandma used to make? When that meal is in front of you, you're going to eat it. Food is one of life's pleasures. Now imagine the healthiest, most ideal meal you could eat. How can you find a place in the middle between your favorite unhealthy meal and the healthiest one you can imagine? You can achieve significant results by making small changes over time. Instead of restricting, how can you make it a little bit better? If your favorite meal is a juicy cheeseburger with a side of french fries, how could you improve it? Remember we're not throwing it away and eating salad, we're trying to find a way to have occassional room in our diets for the things we enjoy without wrecking our health or waistlines. 1. You could cut the entire meal in half. Eating half of an unhealthy meal cuts the calories in two. Eat half the burger and half the fries. Sharing is caring. 3. You could remove parts for the meal that aren't as important for your enjoyment. Take away the extra cheese slice, skip the mayo, ditch the bun, or remove just the top part of the bun. 4. You could eat it as served, but eat it slowly and savor every bite. Chew each bite twenty times and stop eating when you feel about 80% full. 5. Or you could eat that meal, enjoy every last bite and move on with your life, guiltfree. Occasionally that is a fine choice too. If you make healthy choices most of the time and then try to improve your less-than-healthy meals with the strategies above, you'll go a long way in improving your eating habits. I am certainly not suggesting that we eat unhealthy foods all the time, but instead make the best of them when we occasionally do. I look at every meal and think to myself, how can I make this a little bit better? Then I don't have to deprive myself of anything. I make the best choices possible, most of the time, and after a while, the healthy food becomes the food that I want to choose. The junk food loses its appeal. It's a more balanced approach to healthy eating. It helps us stay sane and on track. I learned a long time ago that striving for perfection is a losing battle. It's better to take a moderate approach over the long term than bounce from one extreme to the other. Balanced eating gives me the freedom to eat the foods I enjoy while remaining mindful. I don't eat clean, I prefer to say I eat balanced. What do you think?